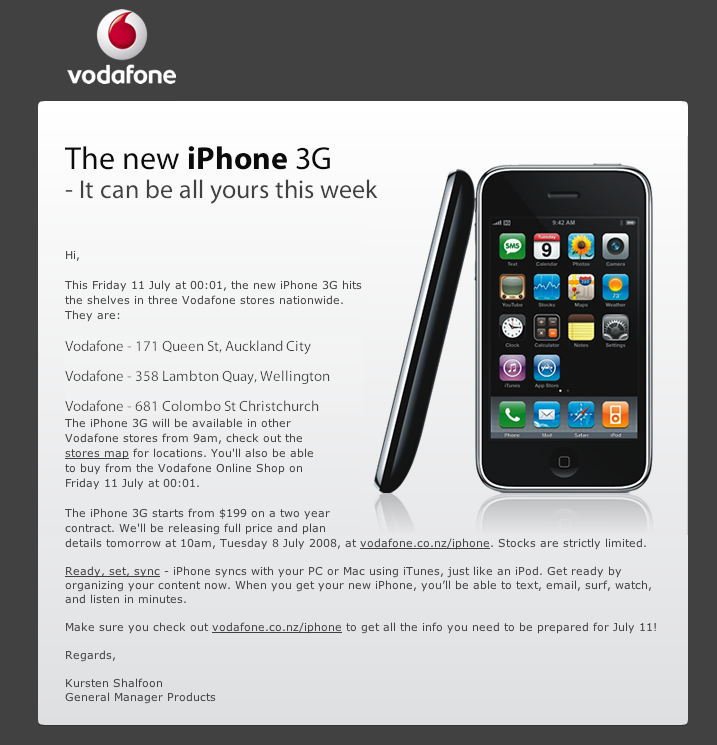 Vodafone sent out an email (screenshot) announcing that the iPhone 3G will be launching in New Zealand at a 12:01 am on the morning of Friday, July 11th at three Vodafone stores (Queen St, Lambton Quay, Columbo St) nationwide. Meanwhile, New Zealand's other Vodafone stores will begin sales at 9am. Their online store will also start accepting orders at 12:01am. A 12:01am launch means that New Zealand customers will be the first in the world to get the new iPhone 3G by a large margin. This corresponds to times of 5:01 am Pacific, 8:01 am Eastern, and 1:01 pm London time on July 10th. Meanwhile, the U.K.'s O2 announced that they have started accepting pre-orders for the iPhone 3G today. The iPhones will be sold on a first-come first-serve basis and will be only available for individuals signing up for a contract. A PAYG option will be coming later. Those who order now will get their iPhone 3G delivered to them on July 11th and existing customers will be able to activate their new iPhones via iTunes at home. Update: O2's website now states that they have sold out of iPhones and instructs users to come back on July 10th for more information. Based on experiences from individuals in our forums, it appears existing iPhone owners were unable to complete the ordering process.